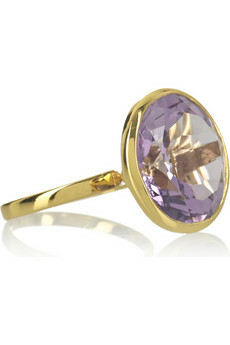 This gumdrop-colored amethyst ring by Honorine is nestled in a simple but modern 22-karat gold-plated setting, showcasing the gem in all its glory. This open setting allows light to flow all around the ring, refracting off of the facets of its exquisite round cut. A timeless beauty that's ready for a trip to the mall or a black-tie affair, this ring is sure to get lots of use...as well as lots of compliments! The Outnet has done it again, with this ring marked down to $153 from $510, truly a steal at 70% off. If purple isn't your color, and you'd rather opt for a green stone, this same style ring is available in green amethyst (aka prasiolite) for $105. Very sweet! Who said you're too grown up for dolls? Goodie bag of what's to come!